Architectural Design Education, Cognitive Style, First Year Architecture Education, Thinking Styles Inventory, Visual Spatial Intelligence. Adanez, G.P., & Velasco, A.D. (2004). Training visualization ability by technical drawing. Journal for Geometry and Graphics, 8(1), 107-115. Alias, M., Black, T.R., & Gray, D.E. (2002). Effect of instructions on spatial visualisation ability in civil engineering students. International Education Journal, 3(1), 1-12. Buluş, M. (2005). The investigation of the thinking styles profile of students in the department of elementary education (In Turkish). 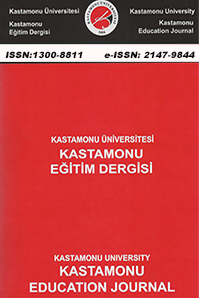 Ege Journal of Education, 1, 1-24. Burnet, S. A., & Lane, D. M. (1980). Effects of academic instruction on spatial visualization. Intelligence, 4, 233-242. Cho, J.Y. (2012). Three areas of research on spatial ability in the architectural design domain. Journal of Architectural Engineering Technology, 1(2). Clark, A.C., & Scales, A. (2000). A study of current trends and issues related to technical/engineering design graphics. Engineering Design Graphics Journal, 64(1), 24-34. Clements, D. H. (1999). Geometric and spatial thinking in young children. In J. V. Copley (Ed. ), Mathematics in the early years (pp. 66-79). Reston, VA: National Council of Teachers of Mathematics. Curry, L. (1983). An organization of learning style theory and constructs. L. Curry (Eds. ), Learning Style in Continuing Education, Canada: Dalhousie University. Dai, D.Y., and Feldhusen, J.F. (1999). A validation study of the thinking styles inventory: Implications for gifted education. Roeper Review, 21(4), 302-307. Erkan Yazıcı, Y. (2013). Effects of spatial experiences & cognitive styles in the solution process of spacebased design problems in the first year of architectural design education. International Journal of Technology and Design Education, 23(4), 1005-1015. Erkan Yazıcı, Y. (2010). Bilişsel farklılıkların ve mekansal deneyimlerin ilk yıl mimarlık öğrencilerinin tasarım süreçlerine etkilerinin araştırılması. (Investigation of the Effects of Cognitive Styles and Spatial Experiences on The Design Processes of First Year Architecture Students) PhD Thesis, Yıldız Teknik Universitesi, Mimarlık Anabilim Dalı, Bilgisayar Ortamında Tasarım Programı. İstanbul. Turkey. Fer, S. (2005). Validity and Reliability of the Thinking Styles Inventory. Educational Sciences: Theory&Practice, 5, 433-461. Gardner, H. (2011). Frames of mind: the theory of multiple intelligences. (3rd Ed. ), Basic Books. Lazear, D. (2000). The intelligent curriculum: Using MI to develop your student’s full potential. New York: Zephyr Press. Ramful, A., and Lowrie, T. (2015). Spatial visualisation and cognitive style: how do gender differences play out?, Proceedings of the 38th annual conference of the Mathematics Education Research Group of Australasia, pp. 508–515. Riding, R. J., & Rayner, S. (1998). Cognitive styles and learning strategies: understanding style differences in learning and behaviour. London: David Fulton Publishers. Riding, R., & Cheema, I. (1991). Cognitive styles – an overview and integration. Educational Psychology, 11, 193-215. Saban, A. (2010). Öğrenme ve öğretme süreci yeni teori ve yaklaşımlar. (5. Baskı) (Learning and teaching process: New theories and approaches (5th Edition), Ankara: Nobel Yayınları. Sternberg, R. J., & Wagner, R. K. (1992). Thinking styles inventory. Yale University. Sternberg, R. J. (1988). Mental self-government: A theory of intellectual styles and their development. Human Development, 31, 197- 224. Strong, S., & Smith, R. (2002). Spatial visualization: fundamentals and trends in engineering graphics. Journal of Industrial Technology, 18(1). Wai, J., Lubinski, D., and Benbow, C.P. (2009). Spatial ability for stem domains: aligning over 50 years of cumulative psychological knowledge solidifies ıts ımportance, Journal of Educational Psychology, 101(4), 817–835. Zhang, L.F. (1999). Further cross-cultural validation of the theory of mental self-government, The Journal of Psychology: Interdisciplinary and Applied,133(2), 165-181. Zhang, L.F. (2002). Thinking styles and cognitive development, Journal of Genetic Psychology, 163(2),179-195. Zhang, L.F. (2005). Personality and individual differences, Personality and Individual Differences, 38, 1915-1925. ISNAD ERKAN YAZICI, Yasemin . "The Relationship Between Cognitive Style and Visual Spatial Intelligence Of First Year Architectural Students". Kastamonu Eğitim Dergisi 25 / 2 (March 2017): 805-820.